Thermocouples: Teflon coated Cr Al (K-type)-6 no. - To study the temperature distribution along the length of a pin fin in natural & forced convection. Owing to the dedication of experts in our team, we are counted among the best names in the market proffering Pin Fin Apparatus. They are available at lowest rates. 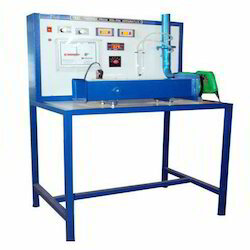 This offered Heat Transfer Through Pin Fin Apparatus is best in quality and meet exact requirement of patrons. These apparatuses are easier to use and show longer life working with not maintenance. Small sized these units are damage free and made of damage free components. 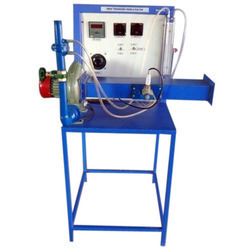 This apparatus is available in market in safe form. Size : 12.5 mm (approx.) 15 cm. long (approx.). Duct : Made of MS.
All the components of Heat Transfer From Pin - Fin Apparatus are displayed on powder coated fabricated stand. The primer consists of a hermetically sealed compressor, heat rejection chamber, drier-filter, expansion device, and heat absorption chamber. To find out heat transfer co-efficient of a finned surface and in a natural convection.